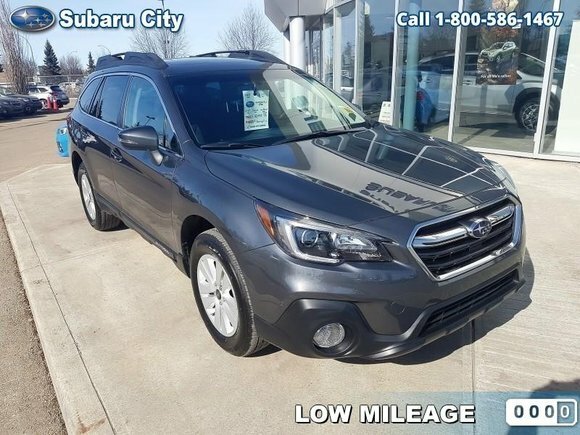 Home > Used Vehicles > 2019 Subaru Outback 2.5i Touring CVT,SUNROOF,AWD,HEATED SEATS,DUAL CLIMATE CONTROL, BLIND SPOT MIRRORS,HEATED WIPER BLADES!!!!! 2019 Subaru Outback 2.5i Touring CVT,SUNROOF,AWD,HEATED SEATS,DUAL CLIMATE CONTROL, BLIND SPOT MIRRORS,HEATED WIPER BLADES!!!!! Low Mileage, Sunroof, Heated Seats, Rear View Camera, Power Tailgate, SiriusXM! The 2019 Subaru Outback was designed for your inner adventurer. Whether improving your commute or finding the perfect backcountry camping spot, this SUV alternative is fit for the road. With impressive infotainment systems, rugged and sophisticated capability, and aggressive styling, the 2019 Subaru Outback is the perfect all-around ride for those that want a little more out of there weekend. This low mileage SUV has just 6571 kms. It's magnetite grey metallic in colour. It has an automatic transmission and is powered by a 2.5L H4 16V MPFI DOHC engine. This vehicle has been upgraded with the following features: Sunroof, Heated Seats, Rear View Camera, Power Tailgate, Siriusxm, Starlink, Bluetooth.